to live within the warmth of your heart and always call it home ." I have always been surrounded by good marriages , great marriages actually and I have seen the love that two people can share when they become one . I have seen how blissful it can be and how petty issues actually become nothingness in front of the enormity of the love . So I am not damaged that way. Yes I have seen bad marriages too , not in close family but they are around everywhere, alot of them. But not close enough to actually influence me in any way.My fears and insecurities arise out of somewhere beyond external control . The idea of marriage scares the bejesus out of me and I can't understand how and why people just get married at such a young age . 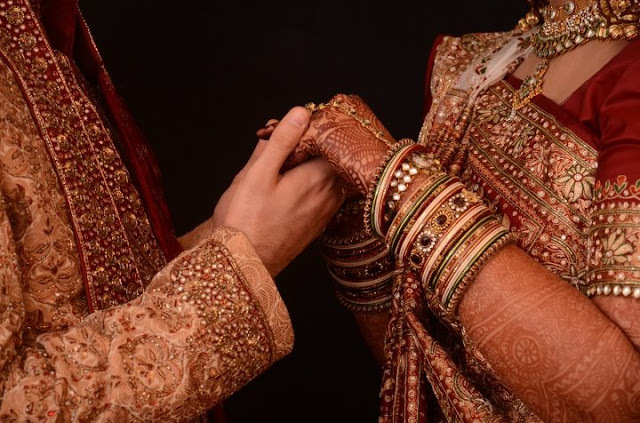 I'm all for arranged marriages and totally love the idea not because I believe in the institution of marriage but because I think getting to know someone from scratch like that is an interesting and exciting exercise. Weddings excite me but the marriage that follows , well not really. The reason people give for getting married is security that the person is going to be yours forever ,says who.? He could marry me today and leave me tomorrow and if someone really wants to leave a piece of stamp paper will not stop them. Also marriage doesn't gaurantee loyalty either , if that person needs a piece of paper to be loyal to me he should just go knock some other door. The other reason is social stigma , the minute the girl turns 25 marriage is hovering like a hungry vulture ready to pounce at every social event. But if I'm not happy with the person I am with or with the marriage in general how does it matter what people even say , they don't have to live with the guy or his family. And again If I'm happy with the person I am with I don't need to marry him to validate that fact for the 'people' either. What do they know right . Other reasons could be financial supporting or security . Well personally I wouldn't be getting married IF i do that is without being absolutely independent financially . Because thats just how I am , I feel odd to ask for something even from my parents . I like getting things my way and I like to earn them. I'm down right stingy when it comes to spending on myself and so I like to work my way through things and so I will. I don't get why live ins are not encouraged. Why do people get married ? If the answer is wedding gifts I totally get it but in case the reason is to be able to stay with each other, I don't think marriage is even necessary If I want to be with someone mentally , emotionally and physically I don't need such a big responsibility of marriage . I could be with them without all the hassle , staying together but just not calling it a marriage . I'm scared of all the commitment and responsibility , all the sacrifices , adjustment etc etc and the list is endless. I'm scared mainly because I have BIG dreams and marriage I feel will put a fullstop or if not that atleast a few commas in the way. I'm scared because I'm indecisive and I can't choose or pick something / someone for life and promise I'll love it forever even though I will. All the promising puts this kind of pressure that I can't live upto. I can't live upto someone's expectations and I can't promise to change. Love should be effortless. Kids too early is a whole new nightmare all together. I'm twisted and have this fear of missing out . Act like I can't have you and I'll go out of my way to make you want me but if you start wanting all that commitment there is a Neon light that goes on in my head which makes sounds like "oh oh " and I'll be gone before you know it. I'm extremely selfish and I can say " I love you" without meaning it . I can make you believe I'm crazy about you without feeling a thing. And no I'm not faking . Don't get it ? Even I don't . I'm a runner but a closet runner. I run from all these things and yet sometimes that special someone can warm me up a bit to remind me of the rose tinted glasses I had dropped off by mistake and I'm swayed by the moment . Eternal optimist in me looks for love in every nook and corner and usually finds it in unusual places , and the looking never stops. I'm a wacko and a contradiction. Hypocrite if you want to add. I'm a work in progress, don't know how it will turn out . Planning never really works out for me . I may run or I may not or maybe someday I'll meet my match. My prince charming after all on that white horse will not give me a chance to run , probably we'll run together. Far far away to a place where the streets have no name. Note to self : After this post no one is going to marry you so start saving for a life with your cats beagle puppies . That picture talks volumes about commitment and trust. Wow, I agree completely! Im not going to marry for the heck of it! pretty adamant about that. Might end up being a cat lady. Without cats though, cause Im not really a cat person either :S But whatevs.